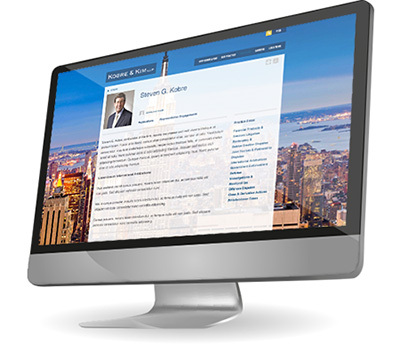 Kobre & Kim, an international dispute and investigation law firm, approached Moiré Marketing Partners for help with their brand and website redesign that needed to stand the test of time. Moiré’s focus was to not make Kobre & Kim look and sound like a traditional law firm, but a global litigation boutique, different from anything else in the market. The research and analysis compiled from the market, the firm’s competitors and the interviews served as the brand platform from which all brand expressions and creative would be developed. Moiré began by revisiting the firm’s brand and conducting a number of interviews with key stakeholders. Due to their unique approach, we established Kobre & Kim as a firm that is “Aggressive. Global. Conflict Free.” This served as the brand's foundation and launched a visual system and new strategic direction. The new website, built using Moiré's LawEngine, highlights its global presence and the comprehensive identity system ensures international consistency. To accentuate Kobre & Kim as a unique firm in the global market, Moiré incorporated rotating images of major cites on the homepage with each major city showing in the background throughout the site, which gives the us a more international and contemporary look.